This week my husband needs as special card for work as one of the senior executives just got some new twin grand-babies. Now all new babies are special but twins is just amazing. So using this weeks AHSC and the lovely Georgie paper packet from CTMH, I came up with this super cute card. I decided to give myself a bigger work area than normal and made this card a 5x7. 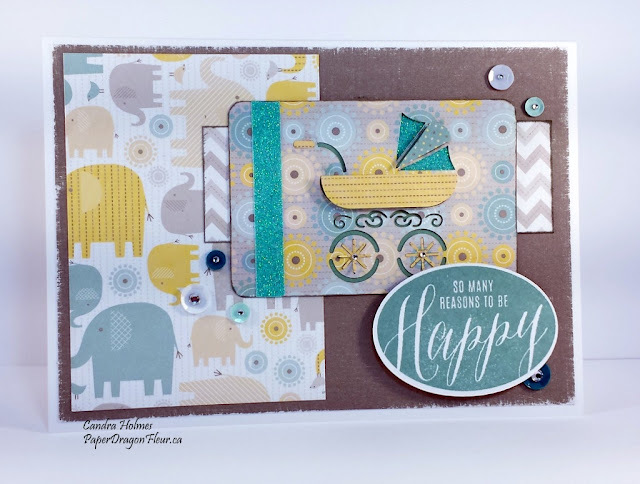 I wanted to use the adorable Pram card cut-out from the Cricut Artfully Sent Collection and didn't want it to be super small or for the card to look crowded. I really like the Artfully Sent Collection in that it has designs for Picture My Life "cards" that can be used in pocket scrapbooking but also can give some really neat embellishment and focal point on cards. Other products I used were the Cricut Artistry Collection for the oval shape and the sentiment is also from the this collection and called Love Right Now (D1682). I used Juniper ink for the sentiment and Slate for some edge distressing. Slate cardstock was used for my base and I sanded it for some added texture. I am in love with the new Aqua Shimmer Trim and I finished off this card with a few sequins from the Ocean and Coral collections (both are now retired but Coral can still be found in While Supplies Last) topped with with a few clear sparkles and my card is done.